The Miss Showgirl Awards seek young local ladies to represent the Mudgeeraba Show for 12 months. The role encourages and promotes the Agricultural Show Movement to Queensland Youth, while also encouraging the participants to become involved with their community and its people. Entrants are selected for their knowledge, presentation, passion for the agricultural show movement and their love of the Mudgeeraba community. The competition is no beauty contest, nor is it a intelligence test, it is an award presented to young Queenslander's who raise the profile of Mudgeeraba, and Queensland Shows. The award provides an opportunity to excel in leadership, community involvement, key management and confidence. If you believe that you could fit this role please consider applying and giving it a go. We look forward to hearing from you and guiding you through the incredible journey. The Mudgeeraba Rural Ambassador Awards is open to males and females, twenty to thirty years of age who have a strong commitment to the rural industries and an involvement and passion for the Agricultural Show movement. The aim of the Rural Ambassador Competition is to highlight the importance of young people in rural and regional Queensland, in particular those associated with the Agricultural Show movement. The award identifies those people actively involved in their local Show, who have a sound knowledge of current rural issues affecting their local areas, Queensland and Australia and have a strong affiliation with agriculture. 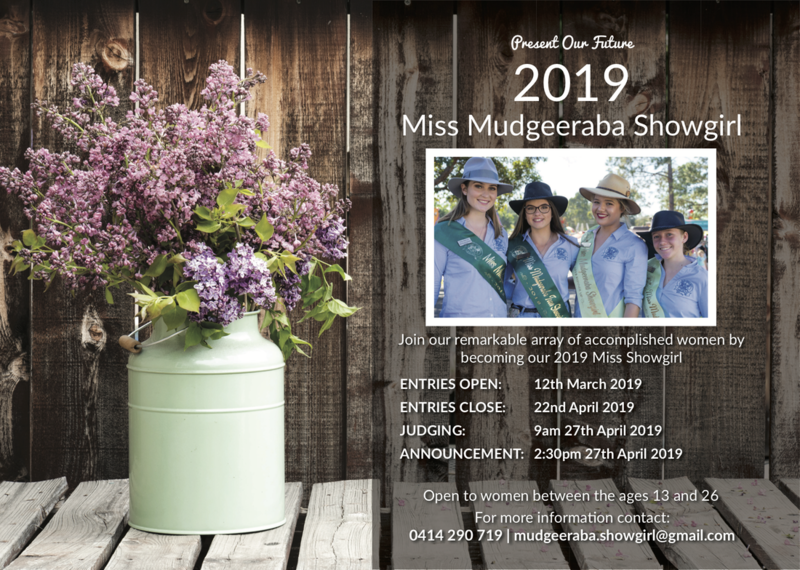 We rely on our Sponsors to prepare our Showgirls and Rural Ambassadors for the Show Weekend and beyond, if you would like to Sponsor this program, please contact mudgeeraba.showgirl@gmail.com.